The latest edition of the academic journal Place Branding and Public Diplomacy has just been published. In it you’ll find an editorial written by the journal’s editor, Robert Govers, our Associate Editor Natalia Ferrer Roca and myself. In the editorial, we reflect on the findings of a survey we conducted in 2016, about what place professionals (practitioners) think about place branding research. We also asked which topics should receive more attention. Since we already published the results of the survey and the editorial being freely available here, in this post I focus on a question which comes up regularly and which is particularly relevant for the growing number of aspiring postgraduate students keen to focus their research on the branding and reputation of places. 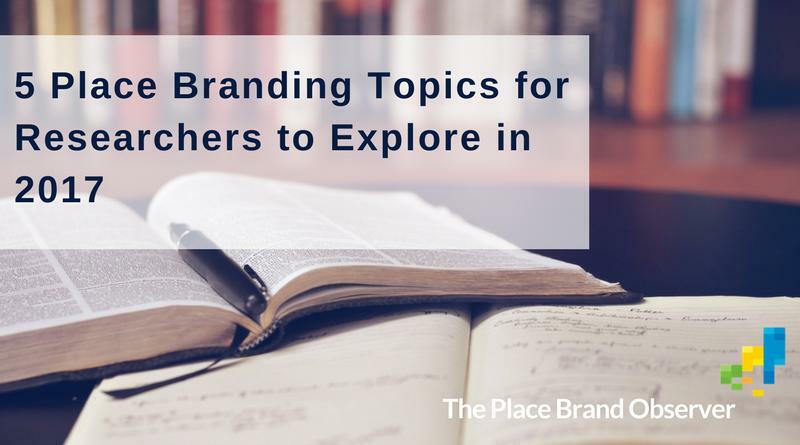 Based on the survey and on our interviews with leading place branding academics, here are five topics with considerable knowledge gaps, suitable for bachelor dissertations, doctoral theses and anything in between. Feel free to reach out to me if interested in any of these topics. Just like ‘branding’, the term ‘sustainability’ is often misunderstood. In a place context, very little research has focused on sustainability in connection with branding (the latter understood as strategic initiative focused on reputation building, place identity and placemaking, not as logo-creation). This is surprising, since a city’s or destination’s sustainability directly impacts its reputation and competitiveness. For example, healthy, livable and save places attract talent and visitors, and prevent own talent from moving away. In a tourism context, sustainability has now become the key concern for city destinations such as Venice, Barcelona or Amsterdam. More and more cities are struggling with overcrowding to an extent where residents suffer and visitors no longer find the authentic, rewarding experiences they might have been looking for. A considerable amount of research funding is likely to be allocated to this area of investigation in the near future. Measuring the effectiveness and thus return on investment of place branding initiatives is extremely difficult, because of the many factors which can influence increase in visitor numbers, investment or stakeholder perceptions. Very useful would be research focused on developing a set of place brand performance indicators, which can be applied globally but allow customizing for locality-specific circumstances. Equally intriguing would be research focused on the effectiveness of place brand strategies by means of looking at how perceptions of a “branded’ place have changed over time and how they differ across countries (target markets). How can villages, towns and small cities benefit from place branding as strategy for place development and management? Perhaps by forming alliances? Very little information is available on place branding at a small, local scale, where large budgets are not available. It is often the small, rural communities which suffer from the young and talented moving away. Research could identify good practice examples and work out at manual for such communities. At a time where ‘traditional’ destination marketing and economic development organizations are learning to reinvent their purpose and to embrace a brave new world, strategic place branding is emerging as THE meeting ground and way to move forward. For this to happen, we need research on how those concepts are linked, where the synergies are and how they can be combined to the benefit of competitive, healthy places. This will be easiest for emerging researchers who have not been trained in any specific discipline and those who comfortable thinking outside the academic box. Most of the larger consultancies whose work is linked to place branding have built themselves a business model around annual indices and rankings, in which they measure all sorts of things. Most of those rankings make it a secret how exactly they have come to their ranks and conclusions, and only reveal detailed analysis at a hefty fee. This is usually no problem for countries or destinations, but can be a major hurdle for cities. We need a methodology for testing how places – and cities in particular – rank in people’s hearts, minds and wallets. If interested in any of those five topics, please don’t hesitate to connect with me on LinkedIn or send an email. Ideally you’ll already have a host university and been accepted to a course or program. At times we serve as external supervisors for master theses. We also provide feedback on research proposals. Keen to explore further? Visit our Place Brand Theory pages or browse through our latest research insights. Thanks to Oliver Zöllner of Stuttgart Media University we also have very comprehensive reading lists, featuring key academic literature on public diplomacy and nation branding. Know someone potentially interested in those five topics for place branding researchers to explore in 2017? Share and spread the word!